Quality Painting For Your Residential and Commercial Properties West Los Angeles, Beverly Hills, Brentwood, Bel Air,Pacific Palisades, Santa Monica, Malibu, Hollywood and more. Concepts In Color, Inc is a professional interior and exterior licensed painting company located in the West Los Angeles area. Interior Painting – Who’s got time? The cost savings and decorative improvement with painting a room can be substantial when compared to other improvements such as new carpet or furniture. Confining vibrant colors to one wall for an accent wall is a great way to change the overall feel without breaking the bank. Painting just one wall can be a quick and easy way to achieve a new look. Concepts In Color, Interior and exterior painting in Los Angeles, Beverly Hills, Brentwood, Bel Air, Pacific Palisades, Santa Monica, Malibu, Hollywood and more. Are you eager to choose an accent paint color for a wall or ceiling but feeling overwhelmed by the possibilities? With some simple tips, the right color choice can be easily found. In recent years, accent walls have become a hot trend. Painting just one wall (or the ceiling!) a contrasting color is a great way to make a bland room come alive. Moldings, trims, and stenciled designs can also accentuate your main color and bring life into a space. Color can have a powerful effect on your mood; be sure to choose a paint color you and your house mates will be comfortable with. Choosing an accent paint color that goes well with the rest of the room is critical. Take a close look at the room. Pay attention to the current wall color, flooring, and furnishings. If your decor includes art, take that into consideration as well. Eventually, a pattern should emerge, with some colors emerging as more dominant than others. Create a natural flow from room to room by using similar accent paint colors in each room; try using one color in your main living space, and lighter or darker shades of the same color in other rooms. Another way to transition seamlessly from room to room is to use the same paint colors throughout the house; just vary the amounts. For example, imagine you love brown, beige, and blue. 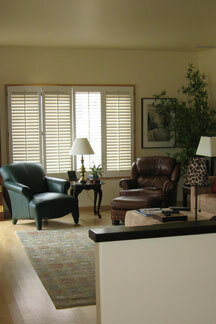 In the living room, beige walls, chocolate trim, and blue furnishings provide a calming atmosphere. In the bathroom, blue and beige striped walls are complemented by rich brown towels and accessories. And in the bedroom, chocolate walls, a beige ceiling, and a soft blue comforter provide a welcome respite at the end of the day. Too complicated? Try making it easier by painting one room white with gray accents, and the next gray with white accents. Lighting is another important factor to consider. A shade that looks fabulous in full sunlight might look terrible under incandescent or fluorescent bulbs. Think about how your accent color will look from different angles, or at different times of day. If you can, try painting a sample square and checking it out in the morning, afternoon, and at night. If you can live with it in any lighting, you’ve found a winner! 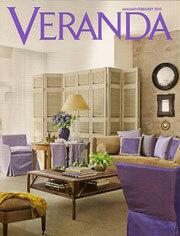 If you have a room that is naturally too dark or too light for your tastes, color can provide a refreshing illusion. Choose a buttery yellow or a bright white to make a dimly lit room feel airier; subdue a sun-filled space with a muted gray or deep burgundy. Find answers to your paint color questions. The decorating magazines may have trained you to think of accent walls as “contrasting” walls, but that doesn’t need to be the case. An effective way to liven up a space is to use an accent in the same color family as your base color. Wouldn’t your bedroom look great with misty blue walls and a navy accent behind your headboard? And wouldn’t your moss green living room look more exciting with an olive-colored rectangle to group your photos in? Find answers to your paint color questions. Many people think of accents as a “pop” of color in an otherwise bland room. In fact, neutrals can be very effective accents. Silver, pewter, and gold, for example, go well with most colors and can lend a very contemporary look to your space. Gray or brown can “bring down” a high ceiling and make a room seem cozier and more intimate, while white, cream, and yellow can “open up” a small space. Using neutrals with high contrast will create a timeless look with visual interest; avoiding super-trendy colors can lend longevity to your paint job, because today’s hot shades will look dated tomorrow. Try adding polish to an otherwise white room by adding black baseboards, moldings, and door trim. Alternatively, you can punch up a dark, navy blue space with gloss white trim for a nautical feel. Find answers to your paint color questions. At Concepts In Color we know that one of the simplest and least expensive ways to revamp a room in a new style is through painting. Contemporary decorating is a comfortable approach to a more sterile modern aesthetic. It includes sleek, clean lines and contemporary materials such as wood and metal. Contemporary painting includes sleek and neutral walls with splashes of color. When painting walls for a contemporary room, it is important to have clean and level lines to enhance the sleek appearance of the room. While some décor styles would encourage visible brush strokes and lines, contemporary design is about removing mess and clutter in favor of clean surfaces. Use contemporary wall colors such as neutral earth tones or light paint colors when painting your contemporary house. Avoid colors with too much intensity such as bright yellows, purples or greens. Instead, use washed out versions of those colors. This will make the rooms in your house look bigger. Popular contemporary colors are beige, light gray, white or light green. Need help picking a color? One complaint of contemporary design is that it appears too stark and uninviting for people that prefer a comfortable and warm style. If this is the case for you, think about accent colors on small walls in entryways, backsplashes, staircases and basements. Choose colors that fit with the color scheme in the room. 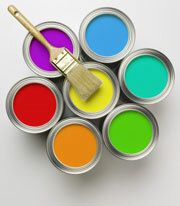 Use very bright colors on very small walls and less bright but still vibrant colors on larger walls. This will keep your room balanced and contemporary. For a more retro and modern approach, paint boxes of color on various walls in your home rather than the whole accent wall. Choose bright but muted colors that mesh well with your home’s color palette. Paint these boxes of color around pieces of wall art to help accent the art, or to frame doorways and windows. Matt at Concepts In Color can help you with some great ideas, not just with Contemporary Interior House painting, but with your exterior as well. 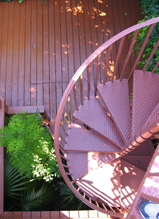 Always feel free to contact Concepts In Color for a free consult about painting your home. At Concepts In Color we are dedicated to make your project successful. Concepts In Color knows that here are as many variations of white as there are colors in the painter’s fan-deck. 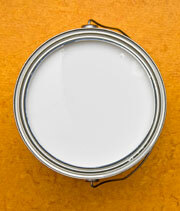 The best white to paint a room is one that’s derived from one of the room’s other colors. Choosing which white to paint is a simple process if you understand a bit about color schemes and where they start. Shades of colors are made by adding black to the base color; tints are made by adding pure white to a color. This knowledge will help you make the right color choice for your interior painting and avoid the costly mistake of having to re-paint. The room’s color scheme is the key. Color schemes commonly start with two colors that are complimentary (those opposite each other on the color wheel). Green and red, brown and orange, blue and peach are common starting places for color schemes. Variations of these main colors produce the schemes used in fabric, and from an inspirational fabric a room’s color scheme emerges. A room’s color scheme may also come from an inspirational painting, a painted plate, or the view outside the picture window. Some professional painting websites, such as ConceptsInColor.com, provide free consultations to help you with your custom color schemes. Base colors can be overpowering in their intensity, so they’re adjusted, often by adding other colors (orange-red for example) to change the value of the base color. Additionally, the base color can be shaded or tinted. The blue and peach starting colors can become sun-glow orange and peacock blue, a very modern color combination. Wall color is chosen from the color scheme. If you’re using a fabric for inspiration, the background color of the fabric is usually a good choice for the wall color. The intensity of the fabric color may be too high, so the wall color may be tinted to produce a softer, “lighter” version of the fabric’s color. As more white is added, the color will appear to be closer to white than to the starting color; but it is, in fact, the starting color — just tinted to a very light value. At Concepts In Color we can help you with your color choices. Contact Matt for a free consult and help getting started. Concepts In Color knows that a border will add visual interest to any wall it graces. Whether you choose to break up a large wall with a contrasting band of color or add a patterned border, the choices are plenty. Before you begin, consider the space the border will adorn and look for details like accents and accessories to come up with an ideal color scheme. To paint a perfect border, use professional painter’s tape for clean lines. Whether you choose to paint one solid band or a collection of thin, pinstriped bands, painted borders add a focal point to tie the room together. The placement of the border depends on your personal taste. Ideas for placement include eye-level, 1/3 of the way up the wall and 2/3 of the way up the wall. The colored border can also act as a chair rail to separate two contrasting paint colors — one above the border and one below. For an organically shaped border decide the general area you wish to stamp and stamp the length of the wall in your chosen pattern. Ideas for stamps include large-format rubber stamps, stamps cut from potatoes, sponge stamps and any other stamp you wish to use. Ideas include trucks and cars for a child’s room, peony blooms for a bathroom border, and polka dots or other geometrics to liven up a dull office space. Don’t let the stamped border become overly busy, and use one image to stamp throughout the length of the border. Choose modern or contemporary stencils to create a jaw-dropping stencil in your home. Modern stencils are akin to the patterns available with contemporary wallpaper. Patterns you can expect to find include damask, retro geometrics, Moroccan designs, cottage designs, Swedish and vintage florals and Old World European patterns. The colored border should add to the overall decor and never detract. Choose patterns to complement the existing design of the room. Look for inspiration in your favorite pieces. For instance, extract a pattern or color from a throw rug or colorful pillow. Buy quality tape and stencils for best results in your border painting. Don’t limit yourself to painting borders according to the materials available for purchase. Rummage through your home for objects like old coffee cans. Use the coffee can to paint a scalloped border around the perimeter of the room. Or, make your own stencils or stamps using vellum, a see-through type of paper. Other ideas include a border of colorful steps, piano keys, book spines and a chalkboard border for leaving notes in the kitchen or foyer. 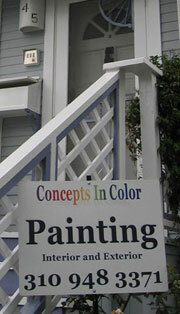 For more information on interior and exterior house painting visit Concepts In Color. Q: Who is going to paint my house? A: The following checklist will help you sort through the process of finding a painting contractor that is right for you. If you see a house that’s been freshly painted, it’s a good opportunity to find out who did the painting. Sometimes you shall see a sign in the front yard advertising for the painting contractor. This is an indication that the customer is very happy and is willing to allow advertising in the front yard. Successful word-of-mouth advertising doesn’t happen unless a painting contractor has satisfied customers. You can learn a lot about a painter from past clients. This step is slightly different from asking around. Now you’re speaking with a specific contractor. You want a list of references. If a painting contractor cannot give you references, it’s a good reason to check that contractor off your list. Ask for a minimum of at least three references, and follow through with contacting each person the contractor claims to have worked with. Ask the right house painting questions. How long ago did you hire the painter? A reference for a recent paint job isn’t as valuable as a reference for a paint job that was completed a few years ago. A customer is more likely to give you valuable information if the job has stood the test of time, and the customer is still happy. Did the contractor do quality work? It’s important to understand what quality work looks like. Even if your friend is happy with the results, you might want to take a look at the finished paint job. Check out areas such as windows, doors and trim. 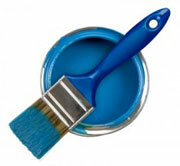 Careful work in these areas is a positive indication of a good painting contractor. Was the painter polite and pleasant to work with? This is more important than it might seem on the surface. It’s important to find a contractor you communicate well with and feel comfortable around. A courteous demeanor is a hallmark of professionalism and will save you unnecessary stress. Also, a painter who is enthusiastic about his job is more likely to do a good job than one who is burned out and just in it for the paycheck. Did the work start (and finish) in a timely fashion? Good contractors let their customers know their planned schedule in advance. And professionals do their best to stick to it. Look for a painting contractor who arrived at a reasonable time every morning. Just remember that exterior paint jobs can be affected by the weather, so watch for customers who hold a bad rainstorm or unseasonably cold temperatures against the contractor! Was a warranty included? A contractor that stands behind his/her work is a sign of a professional. Remember a warranty only has value if it is in writing and extends for a reasonable period. If the painting contractor only guarantees work for one year, it could be a sign that some aspect of the painting work could be low-quality. Thanks: House Painting Info, Webtime Graphics and Consumer Reports. What Are The Best Contemporary Interior Paint Colors? Toss out the old paint chips, and mix up some contemporary color for your walls. At Concepts In Color we know that designers and homeowners with a sense of style are experimenting with new shades of some old favorite paint colors with striking results. White walls are disappearing under coats of inky charcoal. Theatrical shades of rich purple, like aubergine and currant, are covering up the linen and pale blue. A green like antique glazed pottery is gleaming off entire walls. The paint in contemporary interiors is a carefully considered element of the artistry of the design. Purple, the color of royalty, is asserting itself in contemporary décor in far more powerful hues than lilac and lavender. Real deep purple, with strong tones of red or blue or even black, is a choice for high-style reception areas like foyers and social spaces like studies, libraries and media rooms. Slate, pewter, charcoal—gray is a new neutral and showing up everywhere from the pool house to the bedroom. A softer medium gray is rich when painted on walls in faux suede. But the sophisticate is a darker shade of gray, sometimes tempered with brown, sometimes verging on black. Dark taupe or charcoal is dramatic in a dining room or living room and is often bordered with white trim to accommodate contemporary furnishings. The darker grays are cozy in a den with a fireplace and crisp and neat in a kitchen with stainless steel appliances. (Ask Matt at Concepts In Color, Interior Painting in Los Angeles , for more great ideas.) Grays look terrific with wood floors, ceramic tile and terracotta floors, slate floors and hand-loomed Persian or geometric modern carpets. The darker end of the spectrum tends to feel claustrophobic when used with a lot of traditional furniture, heavy drapes and patterns. But it is stunning in a high-ceiling salon with elaborate period furnishings like Louis XV chairs and tall windows that let in plenty of light. With Contemporary Interior Painting in Los Angeles, Celadon and sage are greens that invite more color. The shades hold the watery mystique of Venice and the appeal of the Arts & Crafts style. Naturally, they look gorgeous with Italian gilt furniture and Arts & Crafts pieces. But celadon also calls up Chinese court artistry and blends well with Asian styles. And sage is right at home with everything Western as well as earth-toned natural materials and country décor. Green is versatile enough to use as a glass tile backsplash in a kitchen, a penny tile bathroom floor, the wall color for the public rooms in the house—the living room, dining room, or den–the dusty blackboard paint wall in a children’s room, the single color wall in an otherwise all-white master bedroom. 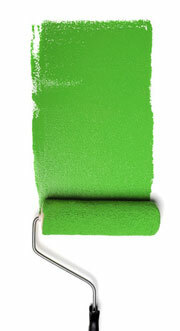 Celadon and sage green are calming paint colors but by no means unremarkable ones. West Los Angeles | Beverly Hills | Brentwood | Pacific Palisades | Santa Monica | Bel Air | Hollywood and more. Special thanks; Benna Crawford Journalist and New York-based freelance writer since 1997. Concepts In Color, Inc is a licensed, bonded and fully insured home and commercial painting company serving the greater Los Angeles and San Fernando Valley areas.